The Put-in-Bay Condos stretches over 3 1/2 acres of prime Put-in-Bay waterfront property. The property has 500 feet of lakefront shore line and a wonderful view of the mainland and adjacent islands. We have a swimming pool, plenty of room to unwind and relax to watch a blazing sunset. Enjoy a game of volleyball, or barbecue your dinner and dine al fresco. Whatever you do, you'll enjoy your stay with us. The Condos are split into two buildings, the first containing our 8 original two-bedroom, two-bath condominiums which are spacious and can accommodate up to eight people. 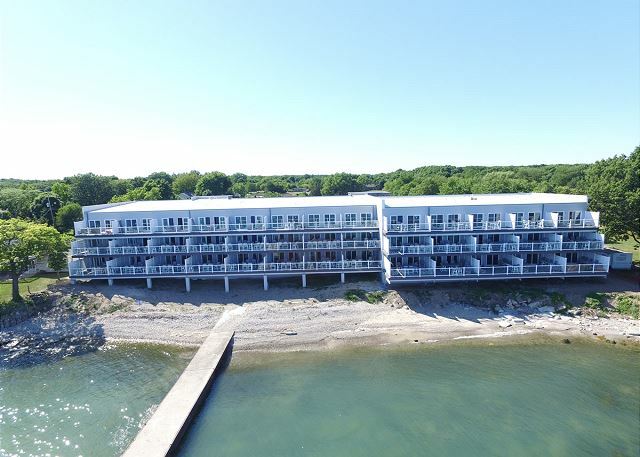 The second, brand new, building has 26 new 10- and 12-person condos all with 4 bedrooms, 2 or 3 baths, and large decks facing the water. This is a great opportunity for families and friends to enjoy island living at an unheard of low rate and be right on the water.